This week marked the kick-off of the most delicious FOND Group project yet. As members of this year’s James Beard Gala Host Committee, we were invited to join in an incredible culinary treat of the southern kind. The “Hot and Hotter” themed dinner was served this Wednesday at the Beard House and featured the impeccable work of JBF Award-winning Chef Chris Hastings, Chris Harrigan, Rob McDaniel and Chris Newsome. The meal did a great job of whetting our appetites for what is sure to be a tasty road ahead as FOND works with JBF to ensure this is their most successful gala to date. We will be tackling the digital promotion and supporting sponsorship and donations for the gala as well as working through the details of VIP experiences, entertainment and community outreach. We are already full of ideas we can’t wait to share over the next several weeks. Partnered with a team of talented folks including returning event chairs Zachary and Lori Pomerantz, this year’s Gala will be one to remember. Set to take place on Friday, November 15 at the Four Seasons Restaurant, the Gala has pinned down a killer theme this year (to be announced soon) which FOND is thrilled to get behind. The annual event serves a key fundraiser for JBF so they can continue to carry out their important work nurturing, celebrating and inspiring America’s diverse culinary heritage through their outstanding programs. More on JBF. Planning is underway and FOND has already begun hitting the pavement to identify the best partners for the Gala. If you know of brands or businesses that might wish to get involved as sponsors or donors for the uber popular silent auction, please send them our way at info@fondgroup.com with James Beard in the subject. And to make you jealous in the meantime, below is our menu from Wednesday’s Meal along with a shot of the southern-inspired goodies we were sent home with. I’m still dreaming about the Vanilla Custard with Wafer Crumbs and Brûléed Bananas. Yum. 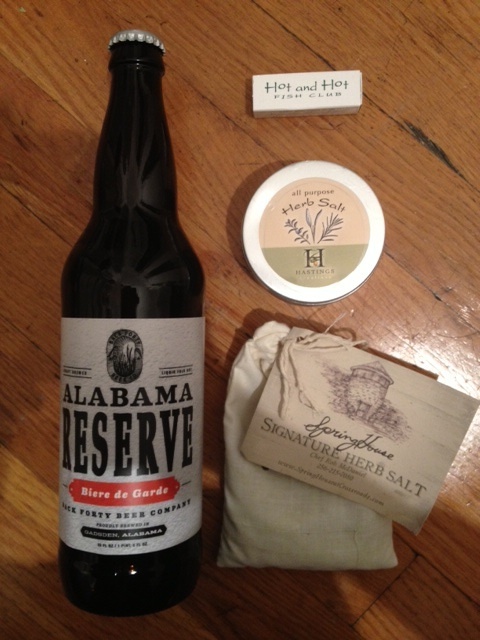 Alabama Reserve Craft Brewed Beer and Gourmet Herb Salts were among the goodies we were sent home with.